Shin Koihime†Musou: Gunyuu, Minami no Shima de Bakansu wo Suru no Koto - Ato, Porori mo Aru yo! A girl encountered by Kan'u's group working as a chef at a tavern in the Gi kingdom in Shin Koihime Musō. Sōsō learned about her when Rinrin accidentally blurted out liking Teni's food better, so Sōsō gave her a test to compare her cooking skills against her own. Sōsō was not so impressed at first, until Kan'u's group noticed Teni prepared the dishes with food they liked at her tavern, and Sōsō conceeded defeat. Then when a raging bull crashed the scene, Teni surprised eveyone with her immense strength when she literally grabbed the bull by the horns and hurled it out of Sōsō's palace, earning her an invitation to join Sōsō's army. 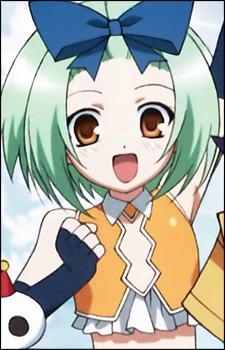 A new character who wields a yoyo as a weapon in the sequel, Shin Koihime Musō. Kyocho's friend and frequent sparring partner. The two of them tend to cause a lot of property damage during their sparring sessions. Like Kyocho, she sees Kazuto as a big brother, calling him 'Nii-san'.